A 24-year-old man with a chronic drink problem was told last Friday at Craigavon Magistrates Court that if he carried on drinking the way he did he would be dead before he was 30. Christian Barclay, Selshion Parade, Portadown, appeared in court by way of videolink from Maghaberry prison. A barrister representing the defendant said on the Tuesday prior to Friday’s court Barclay had appealed a three month prison sentence and this had been reduced to one month. 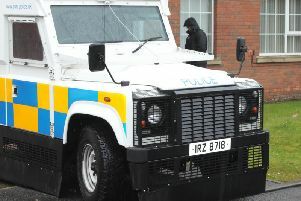 He indicated that his client would be pleading guilty to disorderly behaviour at West Street in Portadown on November 18 last year, resisting a constable and assaulting a police officer. The barrister said the matters, which consisted of drunken behaviour, happened while he was on bail. He explained that since his teenage years Barclay had a ‘chronic drink problem’ and up to the age of 24 he had just ‘drank and drank’. Probation, he added, were prepared to work with the defendant to help him break the cycle of his binge drinking and he did have a job available to him. District Judge, Mrs Bernie Kelly, told Barclay he needed to get his drink problem sorted out because if he carried on drinking they way he did he would be dead before he was 30. She said she was prepared to defer sentence with the conditions that the defendant stayed out of trouble and did not come to the attention of a police officer and he did something constructive about his drink problem. The judge deferred sentence until April 28 and asked for an updated pre-sentence report on that date.